to full-on garden explosion of color! may all your weeds be wildflowers! head over to the papertrey ink blog to see pictures, a video, and the live stream class - there's even a printable file for the box for those who didn't get the kit. and then don't forget to link up to win! let me know if you have any questions, and most of all, have fun!! all the dies you need to build a box that pops up to reveal a whimsical garden - sunshine and insects included! and a mini stamp set with coordinating sentiments for a variety of occasions along with accent flowers that mimic the dies. may all your weeds be wildflowers! in addition to the class product and supplies, you will also receive the limited edition stamp-a-faire stamp set, community garden - another collaboration set with images from several product designers, including me! 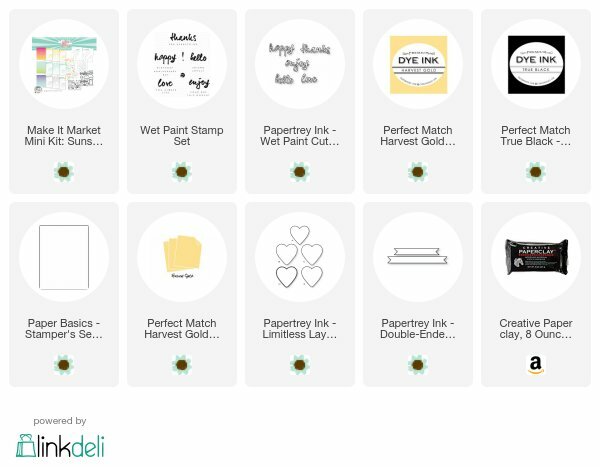 head to the papertrey ink blog for a complete look at the classes and product included or straight to the shop to purchase the kit! hi stamping friends! i’m excited once again to be participating in papertrey ink's stamp-a-faire, one of my favorite stamping times of the year. and this year is even better, super sized and super fun! how great is the anniversary traditions theme?! i have always loved following the annual traditions to choose gifts for my husband each year, so i was really excited to try my hand at translating one of them into a card project. when i started thinking about what i wanted to do, i was immediately inspired by my favorite bowl and the idea of using paperclay to create a “paper pottery” embellishment if you will. so here we are at the 9th anniversary tradition: pottery. head on over to nichole's blog to watch the video and play along. only a few more challenges to go - you’re in the home stretch!! hello again! yay! you've made it to the final challenge!! are you ready for a little color block pop?! i have always loved andy warhol's art, especially the commercial, and now iconic, soup can. and his use of repetition - coca-cola for everyone!! even his business card was a work of art! pop art is for everyone! so head on over to nichole's blog to read the full post, watch my video, and get to color blockin' - stamping, masking, and blending, oh my! here's the rest of my andy warhol pinterest board if you're interested, including links for all of the pictures included here. your favorite supplies and adapt them to the inspiration that speaks to you most! i seriously couldn't wait for this challenge to create a mondrian inspired card with cover plate: comic strip. clean and simple, bold and bright, lots of white. these phrases that describe the artist’s work so perfectly are also what i aim for with practically every card i stamp. and hello, i designed cover plate: comic strip - how did I not create some of these cards sooner? but everything has it's time, and i guess that time is now! so this card is pretty quick and easy given the framework of the cover plate and perfectly colored cardstock. but i also really wanted to include a couple of key attributes of mondrian's work, specifically, black lines that extend to the edge without a frame, implying that they continue on, and subtle texture like his intentional paint strokes. to accomplish texture, i decided to focus on the white space and use fresh snow linen cardstock - easy peasy! and to mimic the lines, i decided to snip the outer frame off of the die cut. this created a minor issue with putting the pieces together again, but i came up with the perfect solution - a white adhesive sheet, sticky side up! i started by sticking one piece of the frame down onto the adhesive paper, and added the other pieces to it puzzle style until it was finished. then i simply trimmed the excess adhesive paper away. the result is a complete layer to easily adhere to your card front, without extra bulk - and without having to put adhesive on the thin frame pieces! i debated on a few sentiment options, including leaving it blank and adding one inside only. but then i remembered this acetate hello that's been hanging around on my desk for a while and it just kind of fell into place! i love that i have a quick sentiment on the outside. the clear die cut adds interest to the layout, while still maintaining the integrity of the original inspiration, which was what i was going for. plus cool hello cards are my fave! SAF 2016: free exclusive set! stamp-a-faire masters is almost here! the official kick-off is tonight, 7:00 pm est on nichole's blog, followed by a full day of stamping challenges beginning bright and early tomorrow morning at 7:00 am est. but first, a little art with heart! a stamper can never have too many flowers and sentiments, which is exactly what you get with the stamp-a-faire exclusive set - for free! i knew immediately that i wanted to pair it with my set give me a hand to recreate picasso’s bouquet of peace. fun, right?! the set works in layers that fit perfectly together, with the two layers of flowers creating a bit of a color blended look, almost like i used three colors in some places and a little like rocking and rolling without any extra effort! i love when i have the chance to rummage through my old and random studio stash to find a solution for a design idea in my head. here, i knew i wanted something for the stems that could go over one hand and under the other like on the painting, so doodling lines wouldn't work. i thought of floral wire, but couldn't find the green that i knew i had somewhere. i was just about to take a green copic to white floral wire (another good option), when i found a few tiny spools of lightweight, colorful craft wire - including green. even more perfect! i simply added a few holes at the edges of flowers with a piercing tool, slid snips of wire into them, taped them on the back, and bent them into shape - adding a glue dot under the "over" hand to help keep them in place. challenge solved! "Art with Heart will ONLY be available on Stamp-a-faire day to all customers who make a qualifying $100 purchase. (before shipping) will receive the set for FREE! You will still earn Rewards Points on your order too, so it's an amazing offer! Please email Papertrey Ink Customer Service with any further questions"
be sure to check out the rest of the team's blogs for more art with heart eye candy and stay tuned to nichole's blog for so much more stamp-a-faire masters fun to come!! Be sure to save all of your partial cards and rejected creations from throughout the day to use in this challenge. Tim Gunn is famous for his "Make it work." phrase and now you will get to apply it to your own paper crafting creation. Take apart one of your rejects or alter it to "make it work," just as Tim always says. so above, is my reject. it started off as one of my cards for yesterday's fashion sense showcase, but i was having a hard time creating a leopard print that matched my vision. i actually forgot to photograph it before i added a couple more layers of color, so you won't see much difference in the leopard print below. even so, while the card is okay, i found it a bit boring and lacking pizazz. i certainly wasn't believing in myself as yves saint laurent's quote dictates! The team will share some inspiring runway looks and showcase projects that derived from the colors and styles found within those inspiration pieces. Printable inspiration cards will be shared as a free download so you can use the same inspiration to create a project of your own! this challenge is a no-brainer with a theme of project runway, right? so i decided to take it even one step further and choose my runway inspiration straight from a recently aired episode of project runway itself! now, this happened to be the winning look. i was kind of torn on who should win between this and the greece look that had the only "safe" score - it was totally a top three! i think the pants here needed a little more work (they never have enough time!) and a different shoe, but i what i really liked was the mix of color and floral pattern with black and white stripes. how literal do you play it? long time, no see! i hope your stamp-a-faire day of stamping is progressing nicely. by now, your work space might be a little or a lot messy, but push most of those "real" stamping supplies aside and get your hardware store haul ready. it's time for the unconventional materials challenge!! Just like the popular television show, you will be challenged to incorporate unconventional materials into a card. Visit your local hardware store and purchase unconventional materials with a $10 budget. Get really creative and try to make it "difficult" for people to tell that the unconventional materials were even used on your project! Be sure to take a photo of your receipt next to your new supplies to add to your blog post before you dig in to start creating! You may integrate any basic paper crafting supplies or tools as well. it's time for challenge two, the patterns challenge. are you ready?! As part of the exclusive Stamp-a-faire Kit (purchase not required), customers will receive a packet of patterns like you would use for making clothing, only these are designed as a unique version of card sketches. Similar graphics will be provided on the blog along with this challenge post. You are challenged to create a card using one of the card patterns to help you warm up for the day. when a set has fun die cuts, i like to group them together and make a collage of sorts. i think my first layout like this came about because i had so many extra die cuts on my desk and didn't want to toss them! anyway, the smaller background panel helps to ground and group the images while still being small enough to have the die cuts extend over the edge for a little added interest. as mentioned on the pattern, the rule of threes is a good thing to remember and incorporate in your groupings. while i was using four die cuts, i paired and overlapped two of them, which makes them read as one, creating a visual grouping of three. so, how about two new examples? here i used comfort food along with a soundburst and word die from zappy birthday. the sentiment portion of the layout lends itself well to soundbursts or speech bubbles, although they're not necessary. a word die cut or even a die cut that is not a word (with a standalone sentiment to the left) would be worthy alternatives. i scream, you scream, we all scream wow! Here's comes the bride, all dressed in white. Except in this case, it's a wedding card that you will be presenting using nothing but white supplies. The only exception to the rule is that you are allowed to use a neutral ink color (black, gray, brown, etc...) to add a stamped sentiment to the card. fashion sense will ONLY be available on stamp-a-faire day to customers who make a qualifying $100 purchase. all orders made between 7am est and 11:30pm est on stamp-a-faire day (August 29, 2015) that total $100 (before shipping) will receive the set for FREE! as soon as i saw the fashion sketch image, i knew that my first card would involve watercolors. i embossed the sketch and using kuretake gansai tambis, i blended pinks and purples for an ombre effect. while it was still a little wet, i stamped in a few dots in pink for a bit of added interest, followed by a wash of silver for a silky shimmer. i really wanted the dress to take center stage, so i kept the rest of the card simple - one of the sentiments - a fabulous quote from coco chanel - plus a couple of strips of coordinating washi tape and voilá! i see more watercolor gowns in my future.